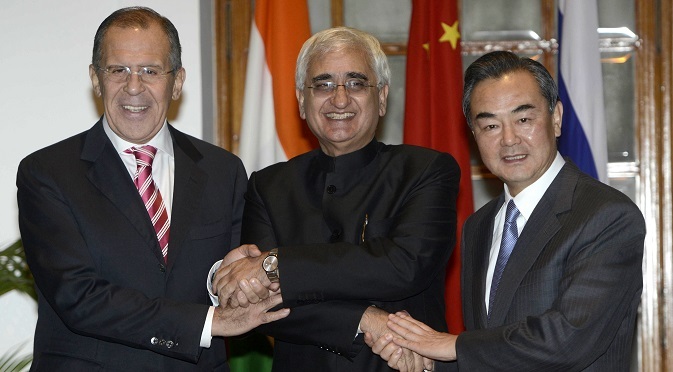 Salman Khurshid, Sergey Lavrov and Wang Yi met in New Delhi under the Russia-India-China format and agreed to expand multilateral cooperation while expressing common positions on most global issues. The meeting of the foreign ministers of Russia, India and China (RIC) was held on Sunday evening at Hyderabad House in New Delhi. A whole range of topics were discussed during the talks, but the main part of the agenda was security. “We have confirmed our intention to strengthen our trilateral cooperation,” India’s External Affairs Minister Salman Khurshid said. “This gives us the opportunity to coordinate our positions regarding international issues.” Chinese Foreign Minister Wang Yi said the trilateral cooperation would contribute to peace and security both in Asia and in Europe. RIC had gradually developed into a stable format, in which the three powers discuss important issues of regional security - whether it is the situation in Afghanistan or the Korean nuclear crisis. It is noteworthy that the current meeting, which is already the 12th, is being held after the successful visit of Indian Prime Minister Manmohan Singh to Moscow and Beijing, where these issues were also touched upon. What remains for the ministers is only to agree on the details and bring the previously reached agreements to a common denominator. “We discussed the prospects of forming a new architecture of international relations that will meet today's realities in the Asia- Pacific region, when everybody feels threatened, when we can’t hide behind national borders when security is indivisible. It is important to avoid attempts to strengthen our own security at the expense of others,” Russian Foreign Minister Sergei Lavrov said. Russia along with China and Brunei offered to develop principles of cooperation in the area of regional security within the East Asia Summit, and this initiative was approved at the summit in Brunei on October 10. According to Lavrov, in the near future, the first round of talks among the participating countries of the East Asia Summit on the discussion of the regional security architecture will be held in the capital of Brunei. The final communiqué issued after the meeting, stated that the world has entered a new era of a multi -polar international system. The ministers agreed to work together to create more stable, secure and equitable international relations based on international law, multifaceted partnerships and respect for the UN Charter. Special attention was given to the fight against terrorism. The foreign ministers condemned the terrorist attack in Beijing, which took place in late October. They agreed that “terrorism is a threat to international peace and security, a serious violation of human rights and a crime against humanity.” In the communiqué the ministers also made it clear that the leading role in the fight against terrorism should be assigned to the United Nations, rather than individual countries seeking a global hegemony, noting that there is a “need for all countries to join the fight against terrorism led by the United Nations, based on the UN Charter in accordance with the resolutions of the UN Security Council.” It is significant that before the meeting, India conducted anti-terrorist exercises with Russia in its own territory, and then with China, which were under the guidance of the UN. The situation in Syria was also discussed. In this regard, Russia, India and China have demonstrated their unity. “We adhere to the general assessment of the situation in Syria, our friends are actively supporting our efforts for a peaceful solution to the crisis without the use of force on the basis of international law,” said Lavrov. “We are all in support of an early convening of the Geneva-2 conference.” At the same time, the Russian minister added that Moscow, New Delhi and Beijing also have common views on the problem of overcoming the difficulties in the process of resolving the situation in Afghanistan, Iran's nuclear programme, the process of resuming talks on the Korean Peninsula in order to ensure its complete denuclearization.